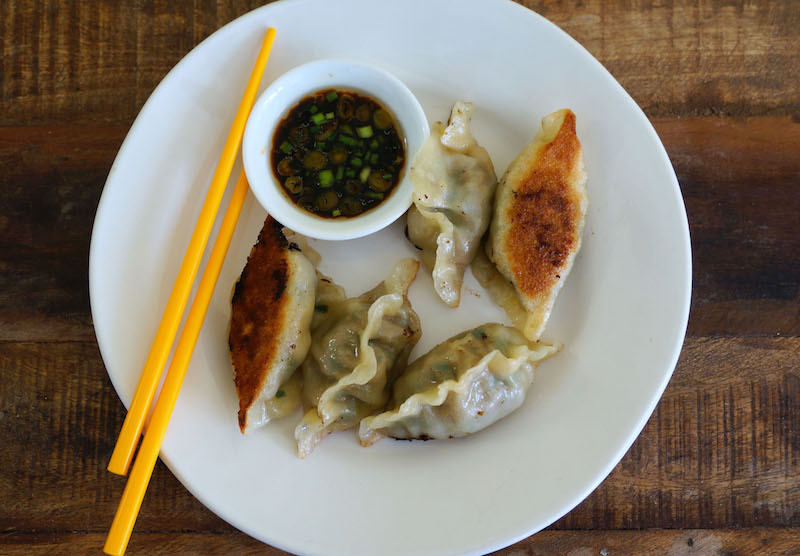 I made these dumplings sometime ago and they were really delicious. Since then, my kids have been craving for more. So last evening, I decided to make some for them. This time though, I made the dumplings using store-bought wrappers. The dumplings turned out great too! If you are keen on making your own wrappers, I do have the recipe over on my older post for these dumplings. Click here to get the recipe. Okay, have a good weekend and Happy 4th of July! Prepare the filling by combining all the above ingredients and marinate for about 30 minutes. Place 2 to 3 of the filling in the center of dough, fold and shape. Add a little oil in a hot pan over medium heat. Then place the dumplings in the pan and pour in about 6 Tbsp of water. Cover with a lid and cook for about 5 minutes. Then drizzle a little more oil all over the dumplings, cook until crispy and toasty on the bottom. Serve the dumplings with the soy sauce mixture and some chopped scallions. Mmm I just love gyoza <3 your post reminded me I had a batch of these that I had made a couple of weeks ago in the freezer - guess what I'll be having for lunch!! Angie, your pot stickers look soooo yummy. I haven't made these for ages, you've inspried me to do them again very soon. Thanks for reminding me. Oooooh! I love making these! Your recipe sounds fantastic! Thanks for sharing! I love making dumplings at home. I haven't in quite awhile, and after seeing yours I may not be able to avoid it much longer! They look picture perfect, and I bet they didn't last long at all! I can't wait to try this! The pictures are so mouthwatering! Angie these look DIVINE and I'm scribbling the recipe down now to try asap! THANKS!! Yums!! For those who like a spicy kick, can cut some small chilies (chili padi) and put them in the soy sauce. Or do it with a Sichuan twist and put in some chili flakes with chili oil. or... have it with mayo like gyoza! I am a complete dumpling fanatic! These look delicious! Store bought wrappers seem like a good way to go most nights.